... for the Arts and London Community Foundation. 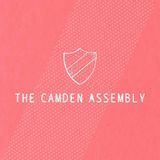 Camden... assembly is not wheelchair accessible. From pub gigs to massive moods to big tunes to post-show routs, the brief but punchy rise of this London cover band has been quite the spectacle in 2018. Come join as the Baker Street Boys take the stage for their first planned show in the new year: new songs, old favorites, same brash attitude.